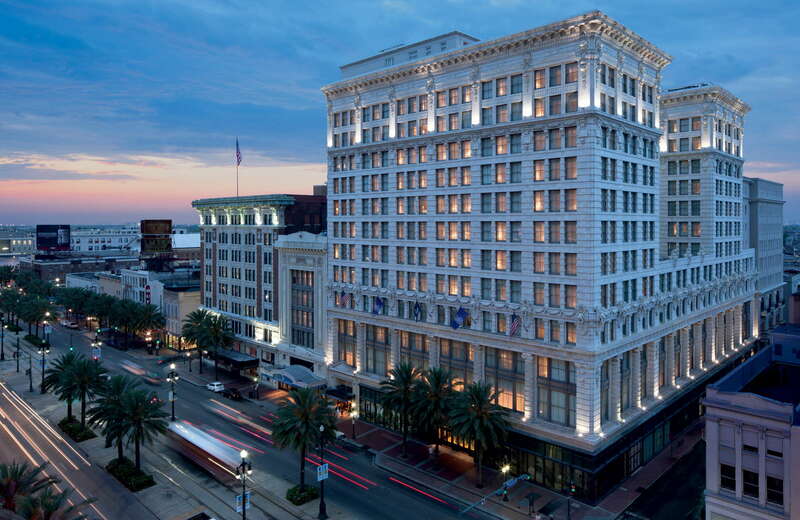 From its entrance on a busy section of downtown Canal Street, you’d never guess just how much spacious luxury awaits you at this resort-like Ritz Carlton location. 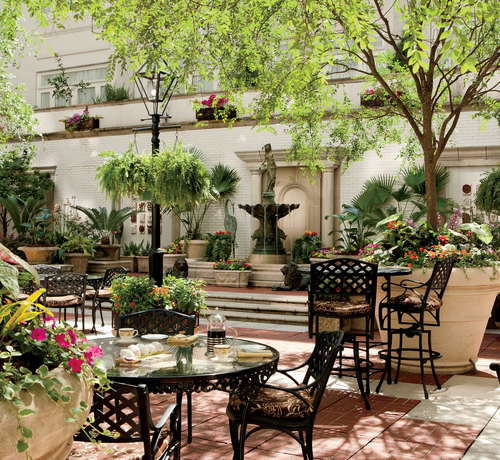 The top notch spa and beautiful public spaces let you recharge in the utmost elegance, while still landing you close to the Canal Street streetcar and some of the city’s best sights. 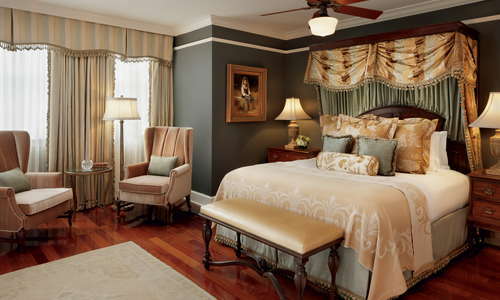 Rooms feature antique-inspired decor with antebellum charm, fine linens and over-sized king beds. 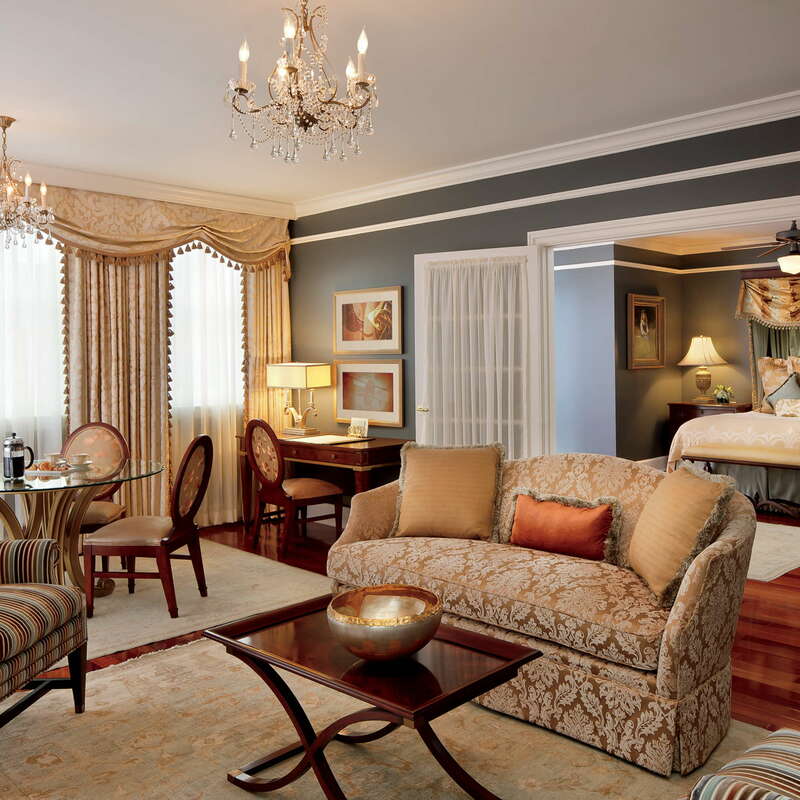 For an extra $100-200, book a club level room and enjoy access to a parlor-like lounge with its own concierge, complimentary wine, and spirits and varied gourmet food spreads. Marble bathrooms feature large sinks and vanities. The standard king has a bathtub/shower combo, where club level kings feature jaccuzzi soaking tubs. There’s a small street level welcoming lobby, but the wide third floor is where you’ll find guests mingling and relaxing at the wood-paneled library, the central stone courtyard, or one of the many elegant plush lounging areas. 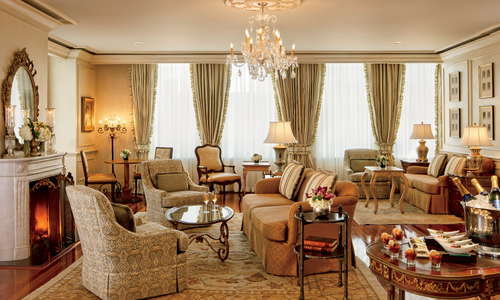 Guests can enjoy complimentary tea service twice daily, accompanied by a harpist on the weekends. The cavernous basement level below the lobby has the feel of an old European bathhouse. Here, guests can swim laps in the large rectangular resistance pool or soak in the adjacent hot tub. 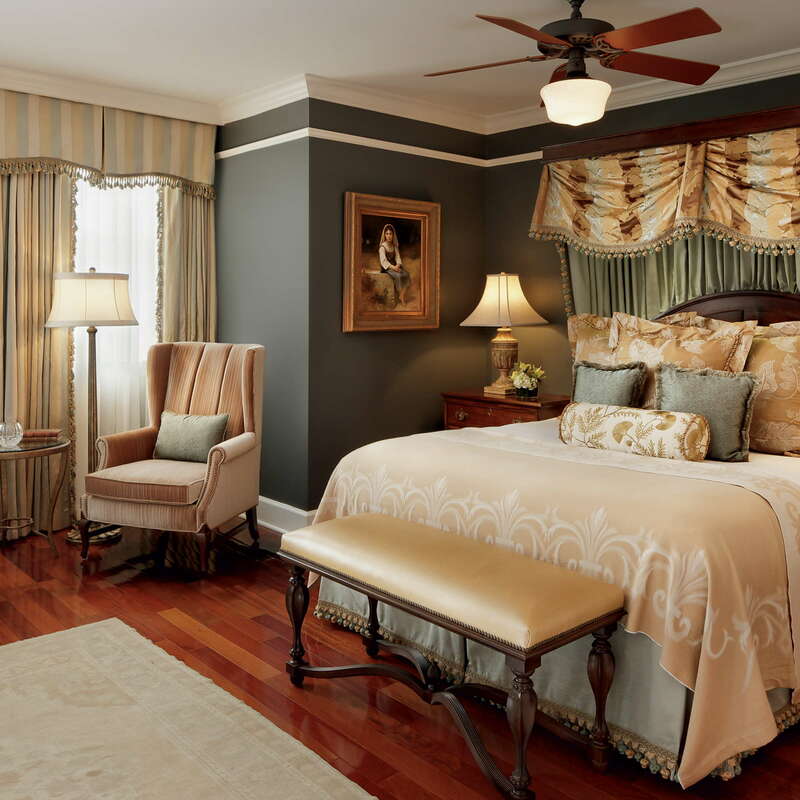 At 25,00 square feet, this is the largest hotel spa in the city, and the entire spa floor, with its wide, tiled hallways, arched doors, and gold accents seeps elegance. 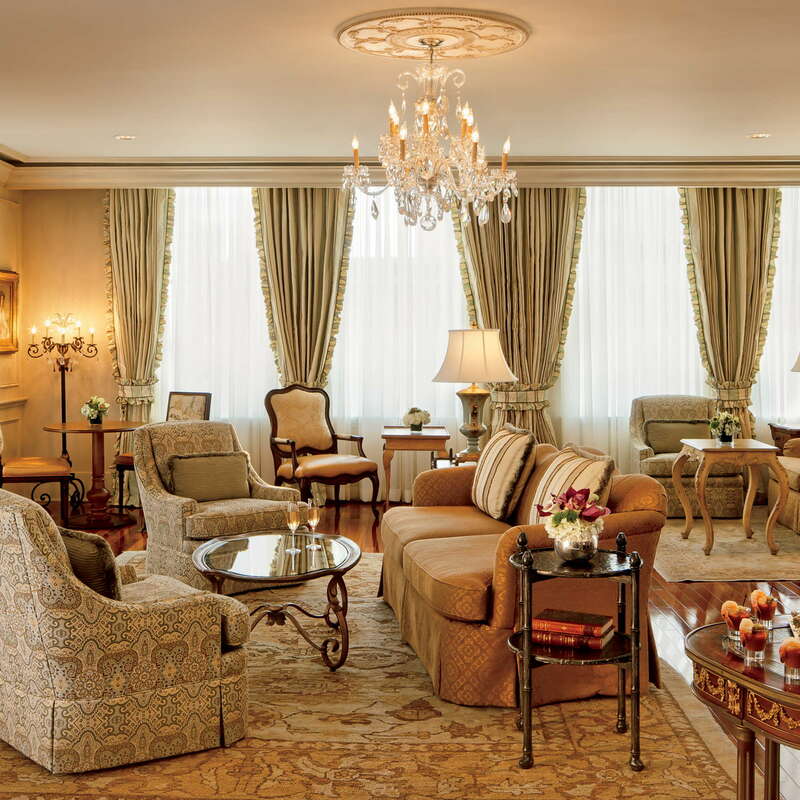 There are 22 spa rooms, a luxury retail shop and a spa cafe for guests to regroup after treatments. This gym consists of a cardio room, weight training room, and a spin studio outfitted with the latest technology. The entire gym is open for guests 24 hours. M Bistro serves organic farm-to-table renditions of coastal favorites and local classics. Special features of the gorgeous dining room include it's wide sky light and "cheater's booths," privately curtained dining booths that add some fun and romance to the meal. The Davenport Lounge gets its name from jazz performer Jeremy Davenport, who graces guests evenings from Wednesday through Sundays. The bar serves wine, beer, cocktails, and small bites. Catch jazz at 5 p.m. to 9 p.m. on the weekdays and 9 p.m. to 1 a.m. on Fridays and Saturdays. The hotel provides overnight valet parking in its own garage. 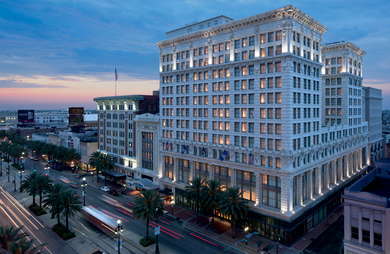 The streetcar will be a convenient way to travel around the city, as it stops directly in front of the hotel. Four different streetcar lines can take you to The Garden District/Uptown, Mid City and the cemeteries, City Park, or the Marigny/Bywater. Across the street you'll find the chic pizzeria Domenica (3-minute walk), great for a date night or lunch. The Ruby Slipper Cafe (1-minute walk), a local restaurant with multiple locations, is a local favorite for decadent brunch. For a more refined meal, splurge on a caviar tower at Restuarant R'Evolution (5-minute walk). The dark wood-paneled Sazerac Bar (2-minute walk) is a romantic way to enjoy some of the best renditions of classic cocktails, and Cajun Mike's Pub (2-minute walk) is fun if you're in the mood for a dive bar atmosphere instead. It's about a 5-minute walk to reach several of the city's best theaters, Saenger, Joy, Civic, and Orpheum, whose bills range from broadway shows to comedy showcases, and the best of contemporary music acts. 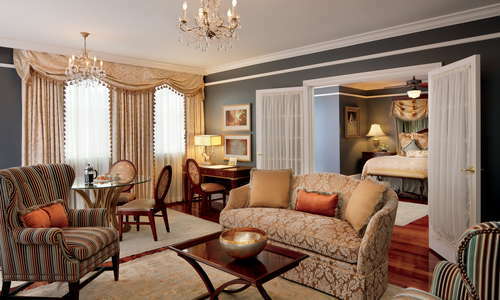 The location is as central as it gets, convenient for business traveler and tourist alike. All elements considered, it's one of the top luxury experiences in the city, but if wellness is a priority while traveling, this is especially the hotel for you: the gym is nicer than most health clubs and the pool and spa facilities are divine.